Giant Monster Rat Pack Attacks the Trylon! Posted on August 26, 2013 by Peter Schilling Jr.
We’ve absorbed a lot of Japanese pop culture over the last 60 years–everything from Pokemon to Tamagachi to Sailor Moon–but nothing has burrowed deeper into the American psyche than Godzilla. Most folks can recognize the big guy on sight, even if the other contestants in his rubber-suited wrestling matches get a little fuzzy. But even cineastes who don’t know their Megalon from their Mechagodzilla will have a good time at Godzilla, Mothra and King Ghidorah: Giant Monsters All-Out Attack. No knowledge of previous entries in the franchise is necessary, and the title alone clues you in to the breathless, gee-whiz spirit of the proceedings. Godzilla has endured more cinematic reboots than Batman, and he’s been variously depicted as a villain, a hero, and an impassive force of nature. This time around, he plays a new role: bringer of divine retribution. It turns out that Japan’s subjugation of its neighbors during the “Pacific War” (what we call World War II) has earned a king-sized punishment for the Japanese people, and Godzilla has arrived to deliver it. Don’t worry about sitting through a somber lecture on Southeast Asian history, though. 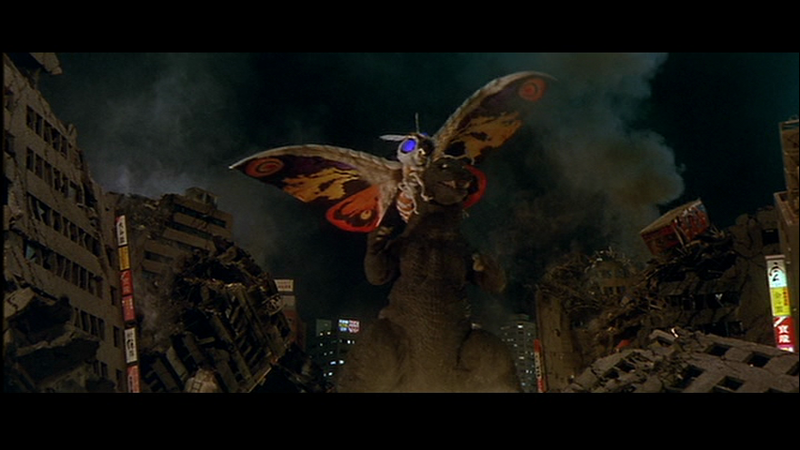 We’ve got rompin’ stompin’ monster action and plenty of it, featuring Big G and two of his best-known adversaries: the electricity-breathing, three headed dragon King Ghidorah and larger-than-life Lepidoptera Mothra. The hapless Baragon shows up too, mostly to get the stuffing kicked out of him, and to provide a little comic relief. Unlike the other three, Baragon never headlined a movie of his own; he’s kind of the Joey Bishop of this particular rat pack.